The draft regulations under the Sectional Titles Schemes Management (STSM) Act, No. 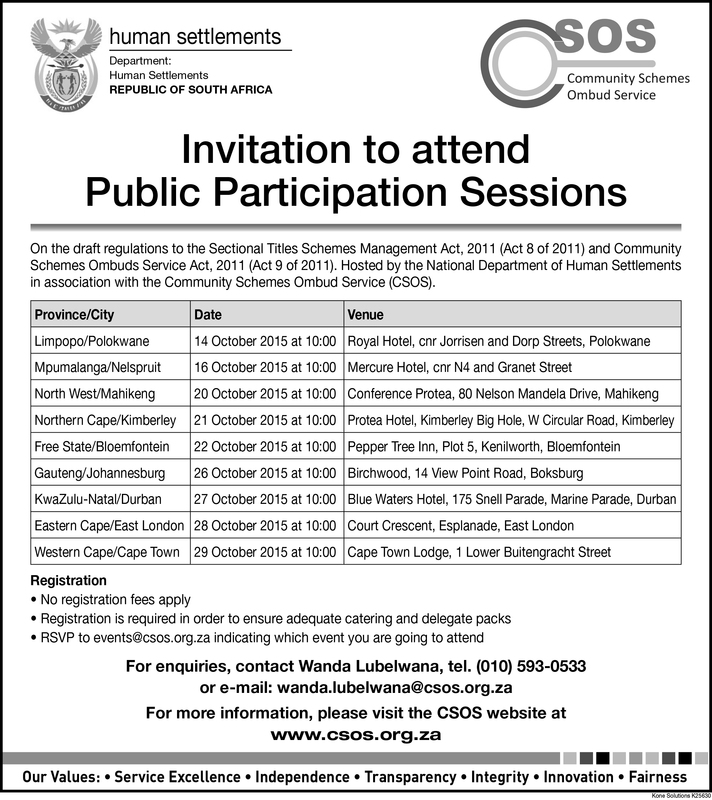 8 of 2011, and the Community Schemes Ombud Service (CSOS), Act, No. 9 of 2011, were published on 2 October 2015 in Government Gazette No. 39247. This document can be downloaded from http://www.gov.za, http://www.gpwonline.co.za and http://www.paddocks.co.za/resources/library/. The Department of Human Settlements has published the draft regulations to give the general public an opportunity to give input which it can take into account as part of the process of finalising these provisions and bringing the two Acts into operation. The issues dealt with in the draft regulations will affect the operations of a wide range of property developments, including all sectional title schemes, homeowners associations, share block companies and retirement developments. The implications for sectional title scheme management are more extensive, as the regulations include revised management and conduct rules. The CSOS will operate a nation-wide dispute resolution service for issues that arise in the administration of community schemes and take custody of all sectional title scheme governance documents. It will monitor and promote good governance and also educate people who have rights and obligations in community schemes. The STSM Act will govern the management and administration of all sectional title schemes. Those involved in community schemes should read the draft regulations and give the Department of Human Settlements their views. People have 30 days in which to deliver comments or make representations to The Director-General, Department of Human Settlements for the attention of Mr T Khambule. These can be sent by post to Private Bag x 644, Pretoria, 0001, delivered to the Department at Justice Mohammed Street, Govan Mbeki Building, Pretoria or send by email to Thulani.Khambule@dhs.gov.za. Persons who have enquiries can also call Mr T Khambule on 012 444 9088. Click on the above image to zoom in for further details with regards to the Public Participation sessions that will be held around South Africa. Join Paddocks Club if you’d like to discuss the draft regulations with our online community. This entry was posted on October 14, 2015 by Paddocks in Legal, management, Meetings, Online education, People and tagged acts, CSOS, department of human settlements, draft, regulations, STSM Act.